What got you into business? Did you think something like, “Hey, I’m awesome at X; I should start a business. Then I can work for myself, make money doing X and have more time for things that I love.” Or were you really excited about business mastery and all the skills that running a business requires? For many small business owners, their passion lies not in running the business. Instead their passion is their skill. But business ownership in itself is a skill; like all skills it needs to be developed, just like a muscle. You can’t just wake up and know how to run your business, or even read some articles on business and think you’ve got it covered. That’s not business mastery, that’s dabbling. But for 4% of successful business owners, they’ve developed a level of skill that takes them beyond just intellectual knowledge and into physical mastery. So how did they get there? Whenever we start something new, it feels good, right? Everything is new and exciting, you’re learning and seeing massive results in short periods of time. But then things get harder, you start to plateau, so what happens? You stop. But mastery means going deep, not shallow. The key to mastery is time and repetition. In order to have true business mastery, you must push through the urge to quit when things get tough. But knowing something isn’t the same as acting on it. Want to gain true business mastery? Here’s a breakdown of the process. Tony used to think that if he read, heard or understood something, he’d mastered it. Time to move on to the next thing. But understanding is only the first step towards mastery. Think about all the times you’ve picked up a business book, started reading a new blog or listening to a new podcast. You get this rush and you think “Hey, I totally understand this.” But when you go try out that new insight or technique, reality sets in; it’s never as easy as it sounds, right? Instead, it takes repetition to dig deeper and move from knowledge to action. No matter the area of expertise, masters know repetition is the mother of skill. Cognitive mastery will not keep your business from failing. Remember, within the first ten years, 96% of businesses fail. To be successful you need to understand your business at a much deeper level. Emotional mastery is where you start linking consequences and doing. You act on what you know instead of just know it. When you add emotion like pain or pleasure to repetition, the link becomes stronger and the action more automatic. Take using a particular word or phrase in conversation with your partner that they dislike, such as “You always…” Every time you say that, they react negatively to it, and then you recoil from that negativity, too – feeling that emotion. Pretty soon, you know not to use that phrase anymore. You know it with your mind and you feel it almost physically as well. Now, apply this concept to your business. Maybe you hired the wrong person or brought in a partner that didn’t feel quite right, but you ignored what your instincts tried to tell you. What happened as a result? We bet you had enough pain from that experience that you think you should do things differently the next time. But even if you’ve been burned once, does that mean you never get burned again? No. People repeat the same mistakes over and over because they haven’t yet associated enough pain with the problem, which holds them back from reaching the last level of business mastery: physical mastery. With enough repetition, enough emotion, we can get to physical mastery. Physical mastery, you don’t have to think about it, you just do it. It’s automatic. No extra effort required. This is the level of true mastery. So how to get to physical mastery? Remember when you learned to tie your shoes, how hard it was? Tongue out, mouth at an angle, total focus, thinking about bunny ears and other techniques; you understood what needed to happen, giving you cognitive mastery. Then with repetition and emotional reinforcement, like praise from people, it got a little easier. Eventually you gained confidence in tying your shoes and today you probably don’t even think about it. It’s the same with business mastery. As a business owner, you may have learned a skilled trade or practical skill that separates you from others and that you’re able to monetize. It doesn’t matter if you learned how to landscape, make jewelry or perform brain surgery; the process remains the same. You went through an unconscious learning curve that took you from cognitive mastery (I know what this concept is) to physical mastery (I embody this and I can do this with my eyes closed). Your task as a business owner is to not only become the best at your trade. Your task is to also have physical mastery over every aspect of your business – from managing your finances to your marketing to your human resources. At Business Mastery, you’ll gain more than just knowledge. Over the course of a year, with repetition, emotion, and physical mastery and expert teachers, you’ll gain what you need to take your business to the next level. How? You start the process with a time management preparation study aimed to help you better manage your business. Next you attend a five-day intensive bootcamp event with others looking to build their business mastery. This immersive environment allows for depth you’d never be able to achieve on your own. 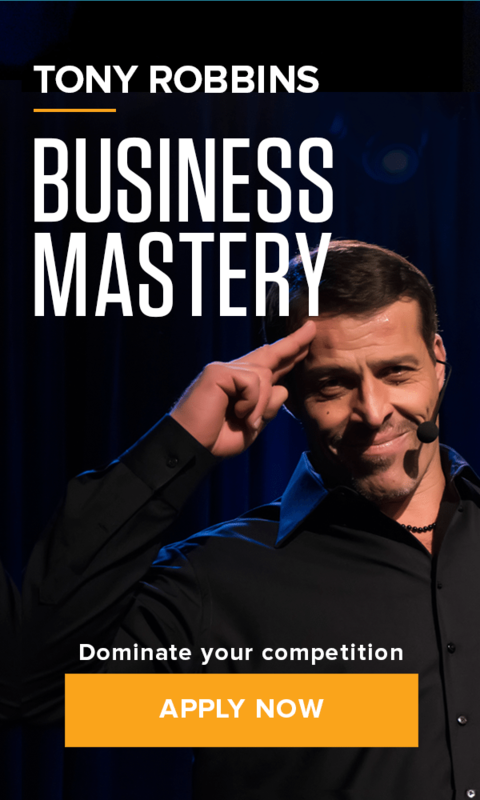 Beyond business concepts, Tony Robbins’ core systems taught at Business Mastery give you a profound understanding of your business and help you achieve immediate results. In fact, Tony is so confident in Business Mastery’s value, he offers a $1 million guarantee: if you don’t get $1 million in value on your first day, he will refund your money, no questions asked. Talk to a Business Mastery Representative today to learn how you can become a true master of your business at Business Mastery.